In 1924, fourteen individuals met at the Bradley’s Corner Community Center for the purpose of organizing a missionary Baptist church. The Reverend J.L. Walters served as the church’s first pastor. After a short period of regular meetings at the community center, the small congregation decided to move to the adjacent oil boom town of Thrift, which was a more central location for the church’s membership. In September of that year, Thrift Baptist Church constructed a building from used lumber donated by an Iowa Park Church that was constructing a new building. The new church was built on the east side of Thrift, on the Waggoner property. In 1952, as more and more church members moved into town from rural areas, the congregation moved the church building to Burkburnett, and the church’s name was changed to Thrift Memorial Baptist Church. An educational building was constructed in 1959, and later additions to the church campus were made in 1961 and 1999. In 1961, the church’s name was again changed to Central Baptist Church, to better reflect the church’s new image as a “city” church. Among the many organizations founded by members of the congregation are the Women’s Missionary Union, established during the 1920s, and the “G.A.” Girls’ Youth Organization, which formed in the 1950s. The congregation has served the community through the establishment of a homebound ministry, a youth praise team and the Sonshiners senior adult group. 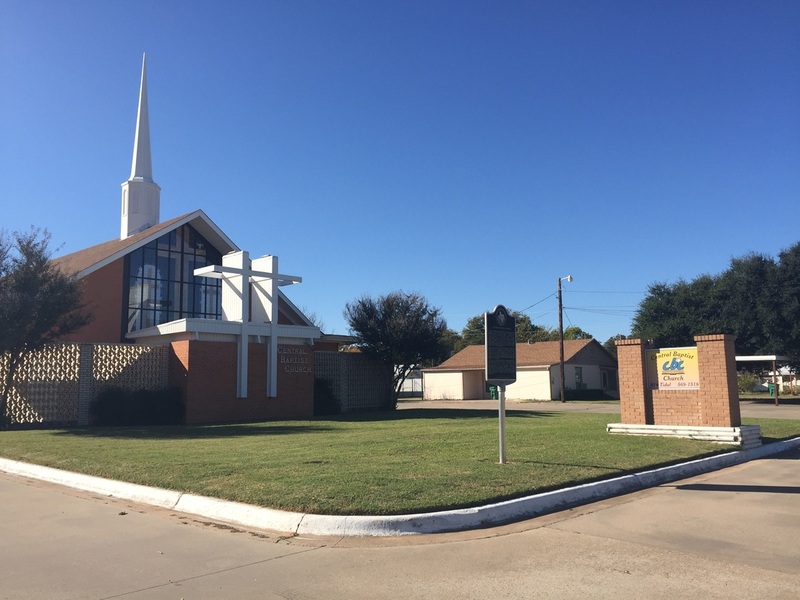 Today, Central Baptist Church serves as a reminder of the small group of individuals who founded Thrift Baptist Church, while continuing as a spiritual leader in the Burkburnett community. 514 Tidal Street, Burkburnett, Texas 76534. GPS 34-degrees 05' 15.9" -98-degrees 33' 42.7".